Austria is a very interesting tourist destination in Central Europe. A mountainous, landlocked country, only a third of its territory is lower than 500 meters above sea level. Austria is in the center of some prime tourist territory; it is bordered by Germany and the Czech Republic in the north, Hungary, and Slovakia to the east, Slovenia, and Italy to the South. Austria has extensive rail lines. When you look at schedules, you'll see Vienna represented as Wien, the German name. Mountainous Austria offers quite a few opportunities for scenic train routes. The best scenic train routes are mapped for you in this guide to Scenic Train Routes in Austria. The Austrian Federal Railways (ÖBB) runs a network of 5700 km of rail lines. Smaller companies run lines on alpine routes. There are lines running only in the summer for tourists as well. Below are some representative times for rail journeys in Austria to other tourist destinations. Times depend upon the speed of particular train chosen. See this Austria City Guide for information on Vienna, Salzburg, Bregenz, Villach and Hallstatt and other top Austrian travel destinations. When visiting some of these top destinations, a tourist often takes a short tour of the city or a tour of the rural treasures found around the outskirts. Viator has a page of its top Austria tours to peruse. Vienna and vicinity is rich in vineyards, and you can see on our Austria Wine Regions Map. The currency in Austria is the Euro. At the time the Euro was adopted, its value was set at 13.7603 Austrian Shillings. The primary language spoken in Austria is German. Dialects are spoken throughout Austria: Wienerisch in Vienna, Tirolerisch in the Tirol, and Volarlbergerisch in Vorarlberg. In major tourist centers, English is spoken widely. You'll have a wide variety of eating places, including coffee houses, heurigen (wine bars) and pubs. In general, Austria restaurant food and service is remarkably well done, and not all of it is as heavy as you might expect. Still, you can dine on traditional Schnitzel (thin cut, usually of veal, breaded and fried) and Wiener Backhendl (chicken). To test if a Wiener Schnitzel is up to par, it can be sat upon in white trousers and should not leave a grease mark. This course of action is recommended only for brave souls with unlimited resources for buying trousers. A service charge of 10-15 percent is included in hotel and restaurant bills. Many people add 5% for good service. Attendants get a Euro or so, and taxi drivers expect 10 percent. As Austria is a small country, you might wish to purchase a rail pass for just Austria--but you might get a better deal by combining Austria and one or more other countries. A good combo is the Germany/Austria Pass Looking to go east? 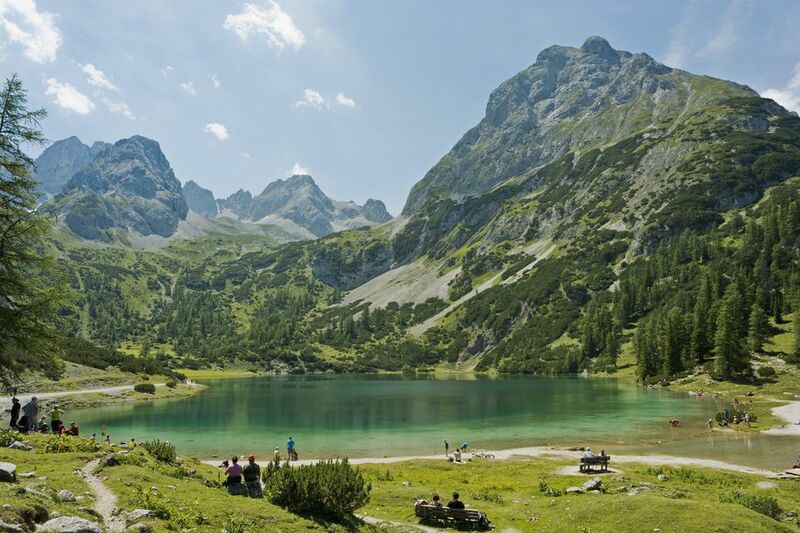 Try the Eurail Austria/Slovenia/Croatia Pass (Buy Direct or Get Information). A single country pass (Buy Direct or Get Information) for Austria is also available. For more Rail Pass information, see Which Rail Pass is Right for Your Vacation. General Speed Limits (unless posted otherwise): 50 km/h in towns, 100 km/h on highways, 130 km/h on motorways. Driving on Austria's motorways requires the purchase and display of a "vignette" on your vehicle. Find out more about the Austrian Vignette. Wearing seat belts is compulsory in Austria. There are airports at Vienna, Linz, Graz, Salzburg, Innsbruck, Klagenfurt. The weather in Austria varies with altitude. For a map with information on historic climate of Austria, see Austria travel weather.